We've done the research for you and have all the answers and great candy buffet ideas you need on planning and set up of your next candy buffet. How many jars or containers do I need? What types of jars to use? Where can I find candy jars? How do I choose the candy? What type of candy bags to use? How Much Candy Do I Need for A Candy Buffet? How much candy buffet candy will you need for your party guests? There are three ways to determine how much candy you will need on your candy buffet. The most important rule in making your candy buffet look amazing is having enough candy to fill the jars and fill up the table. You can also fill in with some salty items such as jars or bowls filled with pretzels, chips or nuts. Determine how much candy in weight you want each guest to take home and then multiply that weight by the number of guests that will be at the party. The problem with this is that candy weighs different amounts - a scoop of candy coated sunflower seeds will weigh much more then a scoop of malted milk balls. The other problem is that the guests at the back of the line will have a limited choice when it is there turn if you only buy enough for each guest to have a certain weight amount. Determine how many guests will be at the party and use serving (or scoop) sizes to calculate how much you will need for each guest to have one serving of each type of candy... or at least most of the types of candy. This is how we set up our candy buffets because we want the guests at the back of the line to have as much choice as those at the front of the line. Yes, you will have extra candy left over, but the cost is not as much as you might think. You can limit the serving size of each type of candy by the scoop size and style you choose. Using small scoops, tongs or spoons can limit serving size. You will also need to find candy bags (or containers) that will hold one scoop of each of your candies ... or you can limit the amount of candy each guest can take home by providing small containers. Buy the candy bags first and determine how many scoops each bag will hold. Multiply that by the number of guests and you will know how many servings you need. A smaller bag will limit the amount of candy each guest can take home. Tip: When we plan for a candy buffet we get small bags of the types of candies we want (or close weight / volume substitutes) and count out the scoops we get from each small bag. Then we use that number and multiply to determine how many scoops are in a 5 lb. bag of M&M's for example. Use the scoops, spoons or tongs you will be using in the containers to serve your party guests. Most bulk candy comes in 5 or 10 pound amounts. How Many Candy Jars / Containers? To make the candy buffet look impressive you need at least 7 jars or containers. To fill in you can use bowls full of pretzels, cookies, cupcakes, nuts or chips. Elaborate candy buffets use around 20 jars and containers. You don't have to have a separate type of candy in each jar, you can fill two jars with the same candy if you place them on opposite sides of the table. What Types of Jars Do I Need? The pretty curved candy containers with lids look great, but in addition to them look for styles and sizes that will complement each other. You want to have a variety of shapes and sizes ... and look for jars that are on pedestals to create height. You can vary the height of the jars even more by placing books underneath the tablecloth that some of the jars will sit on that will create height and dimension to your candy buffet. Other containers can be used to hold candy such as plastic pails for a luau or nautical theme party, large seashells, toy dump trucks for a boys party and large teacups for a girls party. Use your imagination and incorporate items from your party theme into the buffet. Tip: Make sure that the openings of your containers are at least 4" wide. There are some beautiful containers out there ... but if a scoop or spoon wont fit through the opening then they are useless. Start looking as soon as you can for great deals on large candy jars for your candy buffet. Some great places to try are discount stores such as Ross, Marshall's and TJ Maxx. Look for large glass containers with and without lids. We found some great deals on our containers ranging from $3.99 - $9.99 for some really nice size jars. Look for vases with interesting shapes, large glasses on pedestals and hurricane candle holders. We have even found great deals at thrift and Goodwill stores - .50 - $1.00 each! 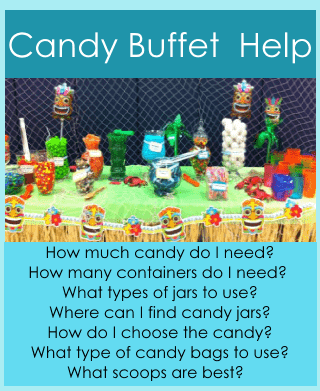 How do I choose candy for the candy buffet? Choosing candy for a candy buffet can be fun - and a little overwhelming. There are so many types, shapes and colors of candy available today that the combinations you can choose are endless. The first place to start is with your party's theme. Choose at least 3 colors from your party's theme and then shop for candies that are in those colors. Try to evenly distribute the colors by having at least 3 different types of candy in each of the 3 colors. Choose your candy based on your party theme. If you are having a beach theme you could choose pixi sticks (sand), rock candy sticks, flip flop gummies ... etc. Almost any container can be used for a candy bag at your Candy Buffet. A popular choice are draw string bags - there are many different sizes, colors and fabrics to choose from for your party. Plastic cups that go with the party theme are also a good choice. Line each cup with a plastic liner and tie with a twist tie when they are done going through the buffet line. Use a container that matches the theme of your party such as a small pail for a beach, luau, Hawaiian or summer party. What kids of Scoops are best? A scoop is good for a large mouth container. For smaller containers use an ice cream scoop or ladle. Tongs work well for sticky candy such as twizzlers and gummy worms. Find great candy buffet supplies on Amazon! To set up the candy buffet make sure that all the containers are within reach of the party guests. Smaller children might need an adults help in reaching the candy. Set up the buffet and do a trial run before the party with different age children. Fill the candy jars 1/3 of the way full to see if the children at the end of the line can reach the candy when it gets to the bottom of the containers. There are great candy buffet ideas on Pinterest. Find several examples that you like that will go with your theme and find candy to match the picture.